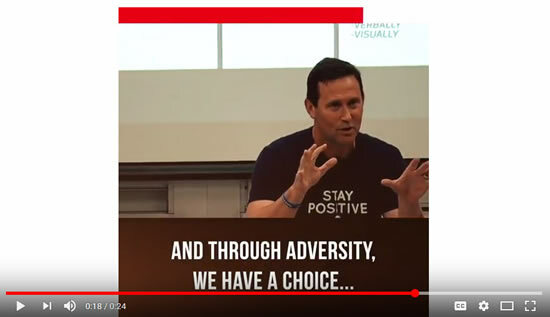 Jon Gordon's latest bestselling book provides practical tools to help teams overcome negativity and enhance their culture, communication, connection, commitment and performance. To build a strong team, family and organization you need to have great relationships. To have great relationships you must invest your time and energy in your relationships. To help you do this I want to share 4 C's to improve your relationships and team. They are practical and powerful. Best of all you can implement them today! 1. Communicate - Communication builds trust. Trust generates commitment. Commitment fosters teamwork and teamwork delivers results. It all starts with great communication. Unfortunately many relationships and teams suffer from poor communication. A lack of communication leads to voids and where there is a void in communication negativity will fill it. We must make time to communicate consistently and constantly in order to fill the void. In a world filled with busyness and stress it takes more time to communicate collectively as a team and individually with your team members but when you slow down and do this you build stronger relationships and stronger teams. 2. Connect - Communication begins the process of building trust but connection is where a bond of trust is created. Connecting is essential because you’ll never have commitment without connection. If you want a committed relationship and a committed team you must make the time to connect with them. A quick tip is to intentionally connect with one person on your team or one person you lead each day. It doesn’t have to take a long time. Even 10 minutes will make a difference. Ask them how they are doing and really listen. Have a meaningful conversation. Ask how you can help them. If every leader and team member did this we would have much stronger teams. Also make time to connect at home. My wife and I take walks at night as a way to talk and connect. We pray together before bed. When my children were younger we had family meetings each Sunday. My children are now in college and I use Snapchat (I only use Snapchat for my family) to send them videos and chat with them as well as Facetime. 3. Commit - Everybody wants their team members to be committed but if you want commitment from others you have to show your commitment to them. It starts with you. I asked a coach, a business leader, and a school principal when your team became great. They all said when we served each other instead of ourselves. Commitment always looks like service and sacrifice. Commit to your team by finding ways to serve them and make them better. In fact, start by picking one thing you will do to be a better team member. When you commit to your team members and team you demonstrate that WE is more important than me and you become the leader and team you are meant to be. 4. Care - If you knew someone cared about you and had your back would you be more open to their feedback? Of course you would. And it's the same with your team members. When people know you care about them they will be more likely to care about you and what you have to say. The often used quote "People don't care how much you know until they know how much you care" is so popular for a reason. It’s true. Don’t just show up and go through the motions. Instead, show your team members that you care about them. When you care you build a team that cares. A team that cares builds greatness together. In future newsletters I'll be sharing more specific ideas about communication, connection, commitment and caring. 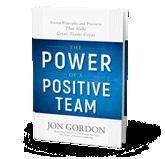 In the meantime if you would like to read more about building relationships and teams read The Power of a Positive Team. Here are some tips I shared on the Today Show to improve relationships. Here are some tips I shared on Home and Family to build a stronger family team. we can run towards each other or we can run away from each other. In each episode we share Positive Inspiration, Encouragement and Lessons to Help You Overcome Your Challenges and Make a Greater Impact. Kerri Walsh Jennings, Sean McVay and More!